Rural Equities Limited (REL) is a company which invests in and manages rural property for long term capital growth and income. Originally incorporated in 1989, the company has its head office in Hastings, New Zealand. 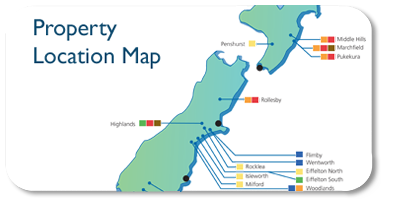 Through its 100% wholly owned subsidiary, the New Zealand Rural Property Trust, it owns a diverse portfolio of twenty-two high quality rural properties spread throughout New Zealand, comprising 9,825 hectares. The farms are a mix of sheep and beef, dairy, deer and arable and are spread throughout New Zealand from Northern Waikato to Southland. There are thirteen farms in the South Island and nine in the North Island. Twelve are leased to individual farmers and the other ten are directly managed. Seven of the directly managed farms are dairy farms and approximately 5,000 cows are milked in conjunction with 50/50 sharemilkers. There is one dairy support grazing property in Canterbury. 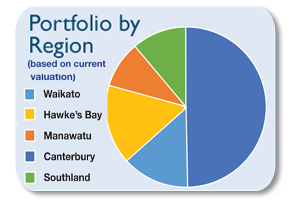 The remaining two directly managed properties (Waikoha and Puketotara) are sheep and beef farms situated in the Waikato district. Environmental considerations and good soil husbandry feature strongly at all REL properties, together with tree planting programmes in strategic locations. 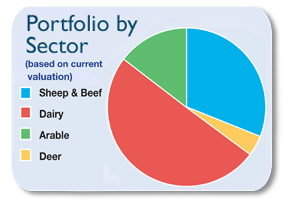 REL has an investment in Webster Limited, an ASX listed company with diversified agricultural operations encompassing cropping, walnut growing, livestock and water entitlements. REL’s investment is 1.54% (5.56 million shares) of Webster. In addition to its rural activities, REL is the administration manager of the PGG Wrightson Employee Benefits Plan and provides administrative and accounting services to a number of other entities.